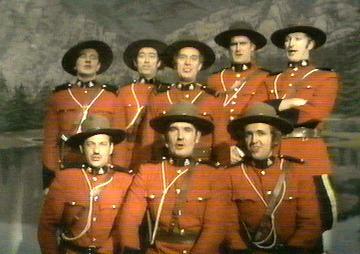 Mounties : He's a lumberjack, and he's okay. Mounties: He cuts down trees. He eats his lunch. Chorus: I'm (He's) a lumberjack, and I'm (he's) okay. I (He) sleep(s) all night and I (he) work(s) all day. Mounties: He cuts down trees. He skips and jumps. Yes, I'm (He's) a lumberjack, and I'm (he's) ok-a-y.